I've come across this interesting problem with an app I'm designing. On the mobile dashboard, the user will have a footer menu with a "shopping" menu option. Right now I have it set to use the same "shopping cart" icon as the cart, which is located in the upper right corner. The best solution I've come up with is using a "bag" icon for the shopping and keeping the "cart" icon for the cart. How would you solve this? I'm not a fan of the bag icon, so I'm open to all suggestions. Do you think the average user is going to recognize the bag icon and think "shopping"? In my opinion, shopping bag icon for going back to shopping is actually perfect, as well as shopping cart icon is perfect for...well, shopping cart. 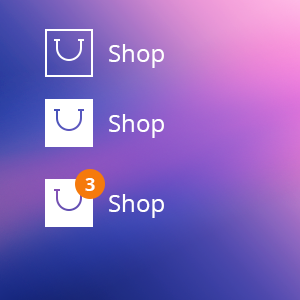 I am a big fan of shopping apps (mainly clothing and food) and those icons are pretty much the 2 icons are always used. It also depends what the shop is for (in food apps, they will often have an icon of food item, like a tomato, or their logo as their 'shopping' link. If it's clothing, tag or hanger icons. If it's video games, a gaming controller/joystick, etc. So, as long as we keep icons consistent, users may find relatively easy to notice that something has changed. However, it's not enough. It's better to add some context as you already did in your mockup, do we'll add the number of elements that have changed. if you want to go the "tab bar only route", you could use the approach I'm showing in the image. in this case, whether you use a bag or cart or tag or whatever icon should be based on... yeah you got it: testing! Not the answer you're looking for? Browse other questions tagged interaction-design or ask your own question. How to deal with recursive hierarchical tableviews? What's the maximum number of individuals registered to one UK postcode?